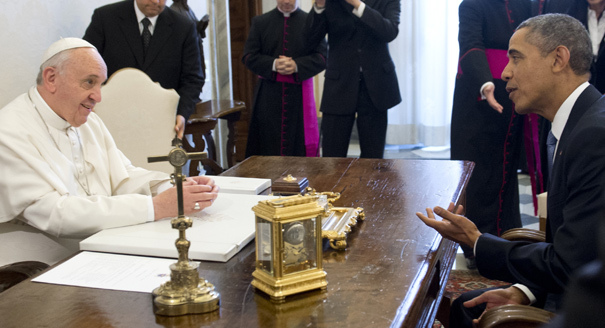 Pope Francis lectured pro-abortion President Obama today on pro-life issues and religious freedom. The details of the private meeting between Pope Francis and pro-abortion President Barack Obama are not yet available, but early indications are that the leader of the Catholic Church brought up pro-life issues with the man considered the “Abortion President” by pro-life advocates. According to a press statement from the Vatican, the two discussed pro-life issues and religious freedom, a pressing issue given the Supreme Court hearing this week on the Hobby Lobby case to stop the HHS mandate, which forces companies and organizations to pay for abortion-causing drugs for their employees. “In the context of bilateral relations and cooperation between Church and State, the Parties discussed questions of particular relevance for the Church, such as the exercise of the rights to religious freedom, life and conscientious objection, as well as the issue of immigration reform,” the press statement said. Kathryn Lopez, a pro-life editor at National Review, said the statement shows Obama may have gotten a lecture, or at least encouragement to be open-minded on these key pro-life issues, from the Pope. Obama downplayed the Obamacare discussion.